I would like to get a more international answer to that question - i.e. which is the answer in different countries. 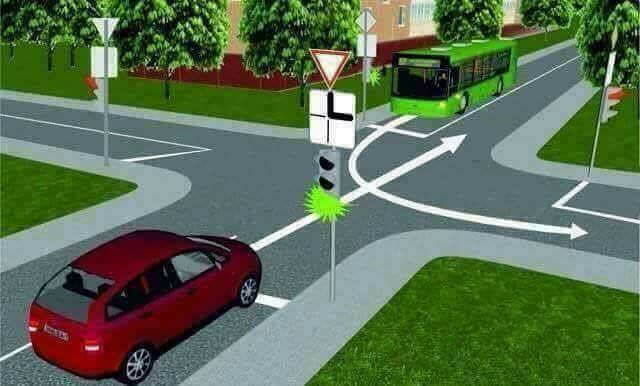 A bit of clarification - both vehicles are on green light, the bus is doing a left turn, but is on a road marked as priority, while the car has a yield sign. The Vienna convention on road traffic says that "traffic lights take precedence over signs regulating priority", which is mirrored in many national laws. But the question here is - is there a conflict between the traffic sign and the traffic light or both have their effect in the situation? Is it a "rule of thumb" in your country that road signs on priority/right of way do NOT matter in case of working traffic lights? In Spain, the traffic lights would take priority over the traffic signs, explicitly by law. Therefore the car has priority over the bus. There is an image illustrating this at http://4.bp.blogspot.com/_0j2fcAJdP_U/SJohg9Y08DI/AAAAAAAAAXs/niX5Dm6xq60/s1600-h/prioridad+se%C3%B1ales2.jpg. I'd say that both the lights and the signs have an effect - if the light is red, you must stop, if it is green you may go, subject to obeying the other signs. The lights take precedence, but do not nullify the signs. Therefore the bus would have priority. For both drivers I would recommend to drive very carefully. The situation is definitely dangerous, and whoever created it needs their head examined. A situation where someone seriously posts here to find out who has the right of way most not be allowed to exist. And there are some rules that overrides all other traffic rules. In order of importance: Don't drive into people. Don't drive into other vehicles. Don't drive into a bus. So proceed carefully, just assume the other car might or might not yield. Not the answer you're looking for? Browse other questions tagged driving traffic or ask your own question. Right turn signal in Pennsylvania - can I turn on red?